I named this hat Unforgettable because I love the yarn. It's so nice and soft to be acrylic (and easily accessible found in all craft stores and big stores). I love all the colors and have bought skeins of each color available. Currently, I'm working on three projects with Unforgettable...very inexpensive gifts when you have a lot to make. Just an FYI: This hat takes a very small amount of yarn to make. I had so much left out of the one skein, I made a pair of fingerless mitts too...with yarn left over. At this time AC Moore has this yarn on sale for $4 a skein. They also have a 50% off coupon, so that makes it about $2-3 for a hat and mitts set. This makes great gifts for hardly any money! This hat took less than one skein. You can easily make it more slouchy by adding rounds. It actually ended up a little too slouchy for my taste, but it's okay. If you want it more fitted just crochet about 14 rounds instead of 16...or however many you need. It's easy to adjust. Note: Join each round. Begin each round with ch 3 which will count as a dc. Rnd 3: 2 dc in first st, dc in next st. (2 dc in next st, dc in next st) around. Join (36 dc). Rnd 4: 2 dc in first st, dc in next 2 sts. (2 dc in next st, dc in next 2 sts) around. Join (48 dc). Rnd 5: 2 dc in first st, dc in next 3 sts. (2 dc in next st, dc in next 3 sts) around. Join (60 dc). Rnd 6: 2 dc in first st, dc in next 4 sts. (2 dc in next st, dc in next 4 sts) around. Join (72 dc). Rnds 7-16: Dc in each st around. Join. Do not finish off. Work ribbing in rows. If you crochet loosely, go down a hook size to G. I crocheted the ribbing rather tightly, so the H hook worked fine for me. 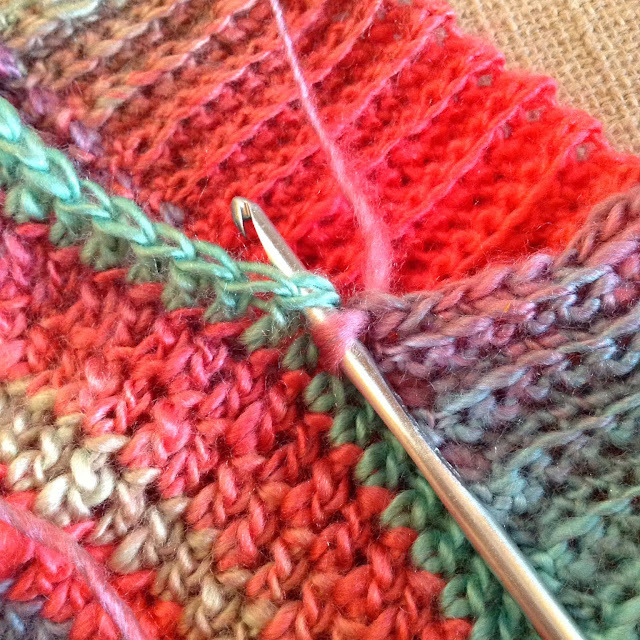 Row 2: Skip over the ch and those slip stitches. Sc in the back loop only in each st across. Ch 1, turn. (11 sc) In the photo below, you can see where I skipped those sl sts and put the first sc in the back loop of the stitch that I'm holding. Row 3: Sc in back loop only in each st across. Sl st into next 2 sts in the last rnd of the hat. Ch 1, turn. In this photo you can see that I am attaching to the last round of the hat. Make sure you do not work into the same stitch that you already have a sl st in. Rows 4- 71: Repeat rows 2 and 3. It can be a little tricky at first to skip over those sl st made. 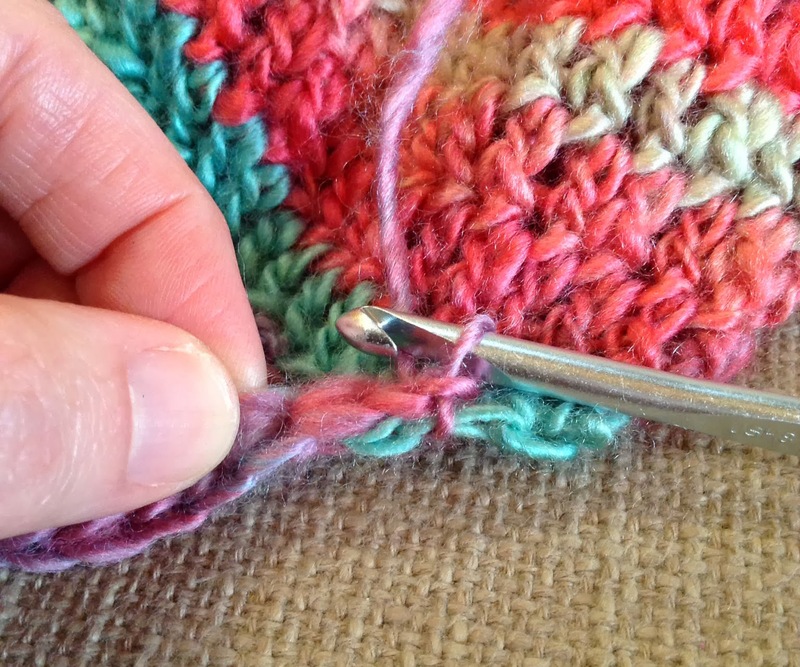 Just count your stitches and make sure you only have 11 sc in each row. 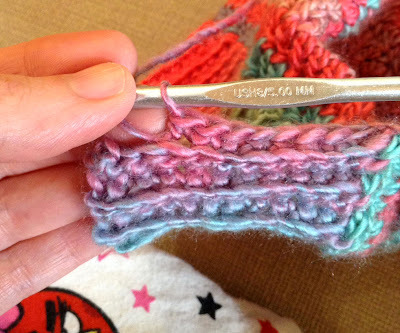 Remember those slip stitches are only to attach to the hat and not to work in to. Keep going until you get all the way around. Sl st into the last st on the hat and into the join. Now turn and sl st the seam together. I turned the hat inside out and slip stitched into the back loops of each of the joining rows. Confused? I'll try to help. Just leave a comment. As I mentioned before, I made a matching set of mitts with the leftover yarn. I'll get to work on that pattern and try to post next weekend. I love this yarn! Your hat looks gorgeous! Great hat. Wish I could get this yarn in the UK. Definitely will give this one a go! Thank you for the pattern! Don't even want to admit how many skeins I have of this fun yarn! I love it! I originally bought it for the crocodile stitch items I was making! It works up so perfectly with that stitch! And I just love the way this hat looks! I don't typically gush over Red Heart yarns, but this one...AND the Boutique Treasures...my oh my!!!! You're welcome. I hardly ever buy Red Heart, only if I need a certain color for something like the ripple or patchwork, but this yarn feels so much nicer. It's nice to see Red Heart coming up with something different and a little better. I haven't bought the Treasures yet, but I will now. Oh lovely, I really like the hat. Thanks for sharing! You have spoiled us. Great hat. Lovely Hat. Great colours ... thanks for sharing. That's so lovely, thanks! And yes, the yarn is amazing! Lovely hat and lovely yarn. Hi! I just found your blog. Love your crochet work! Thanks! 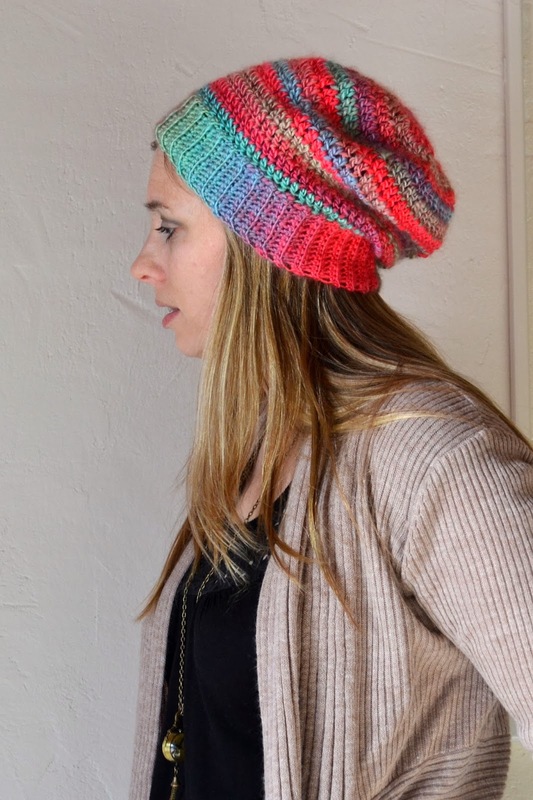 Its just gorgeous, I love the yarn and the hat!!! I really like the tutorial on attaching the ribbing, thanks for sharing! 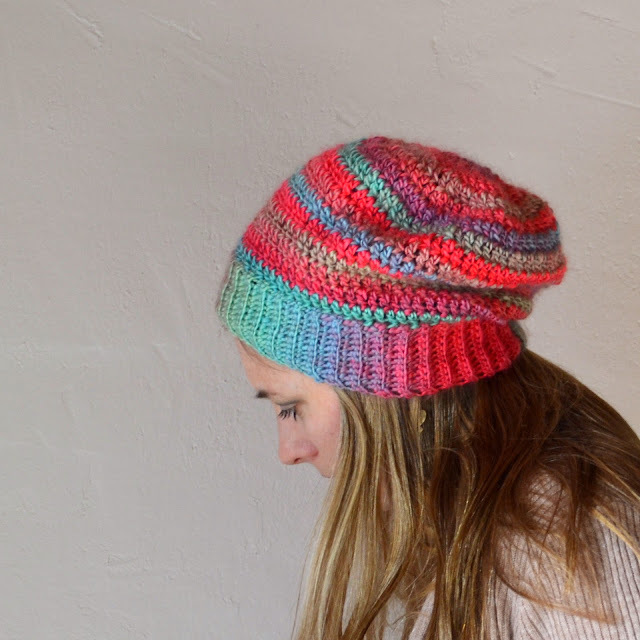 Gorgeous coloured yarn - love the hat...it really suits you. 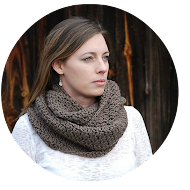 Thanks for sharing this pattern - it's now in my project queue. I can't believe that's Red Heart! Thanks so much for sharing! Liz -- I love when you show new methods of doing things. I remember one time you posted a pattern and mentioned that when you do rounds, you do not join until the second row (I think it was on an infinity scarf) -- I now do that ALL the time, and I totally agree b/c my chains do not get twisted that way plus I can sew it more securely at the end. Thanks for all the tips!! And the hat is beautiful!!! You're welcome and thank you for the feedback. I'm glad i can help. Thank you so much for sharing the pattern for your lovely hat. I am a beginner & am hoping to attempt it as my first ever hat project. You do such beautiful work! Thank you for the compliment and you are welcome. I'm so glad you found something you like here. This hat is awesome. I want to make it so bad!!! :) Thanks for the post! This is next up on my list! I am so excited to learn how to do crochet ribbing! My head is small. I can almost wear my 6 year olds hats. so I'm sure that is the problem. I have made gifts for other female family members and measured with my head not thinking and they were too small for them. I'll include a note about this in the pattern. Thank you for the feedback. I had the same problem. I don't often check my gauge but I did this time. The hat is definitely snug. Hi, thank you so much for your pattern, it's a beautiful hat! I would've never looked twice at this yarn if it wasn't for your suggestion, so thanks for that as well! I have a question about working the ribbing into the body of the hat. I understand what you mean by attaching the first sl st into the first stitch of the hat, but where exactly does the second sl st go - into the next stitch of that same row (so essentially each ribbed row will take up 2 stitches of the hat's body?) or into the next stitch of the row directly above the first sl st? I hope I'm making sense. Oh gosh, I'm sorry I missed your comment. Yes the next sl st goes into the next stitch. Just make sure you don't work into the same st twice. I noticed some hats from other people look as if they have more than 71 or 72 rows of ribbing. I love this hat! I made one for myself and I think if I had it to do over again I would have made less rows of double crochet as I have a small head and not a lot of hair. Otherwise I love it! Do you have the pattern for the matching gloves up yet?! I made another with less rows too. If fits my small head better. I still need to get those mitts posted. It's just a matter of taking the photos. I'm so lazy at times. I was going to make this hat and saw you said you made gloves too...do you have the gloves posted? I haven't been able to find the pattern/post for those. FINALLY!!! I've had 2 skeins of this in my stash for MONTHS!!!! Lol I hadn't found that "magical" pattern for it until NOW :p Thank you so much for sharing!!! You're welcome, and I hope you love it. I would love to make the hat for my granddaughter too, but she's only 2. Can you tell me how to adjust the pattern? I made this slouchy in LB Caribean tweed stripes. It's a 5wt. Now I want to find the yarn and colors you used to make another one. Thanks, I have really enjoyed this pattern and will enjoy the hats as well. You did an awesome job explaining the pattern too! Love the hat and especially love the ribbing method. Thanks for teaching me something new, I don't think I'll ever do ribbing another way again!! Thanks so much for this free pattern- Love it! Combines something old and something new for me. I've made a few dc hats before, but never tried the ribbing like your design. Looks like crochet and knit combined. Just made one last night as I had the same yarn and colorway you used and I love how it turned out! This one is going to charity for cancer patients at MD Anderson, but I will definitely being making more for gifts this year! Just finished making this hat and am in uber-love with it. Thanks so much for sharing the pattern. I just finished this hat and love it but for some reason the ribbing part is crooked! Any ideas on what I did wrong and how I can fix it! Please help! You are my hero! I was wondering if I could make a hat with the exact yarn you are using as a gift, and here it is! A hat with a free pattern! Thank you from the bottom of my heart! I just finished this hat in a matter of an hour. Your pattern was so easy and the best part was the ribbing. I can't wait to give it to my work daughter tomorrow. Thank you so much! I just made this hat in a matter of about an hour. The pattern was super easy and the best part was doing the ribbing. Love the way it turned out and anxious to give to my work daughter. Thank you so much! Love love the ribbing technique. Thank you so much for sharing! Hi.I love your pattern.I made two hats and gave one to my cousin.She loves it so much :) I was wondering if I could sell what I make from this pattern? I would give you credit for the pattern of course. I just finished this hat. Love the pattern, thank you. I blogged about it at NicolaKnits.com today. I made it a little deeper - 20 rounds total - for plenty of slouch! I haven't started this project yet but hope to ASAP. What method would I use to make the band and entirely different color? I love this pattern. For the mits, I used the ribbing pattern long ways from knuckle to past the wrist. Then sewed up the seam leaving an opening for the thumb. They are so soft. Is the fingerless mitt pattern available to go with the Ungorgetable hat? I have trouble printing from your site. So I am completely confused but it might be the fact that I just started all of this guess that's my fault. 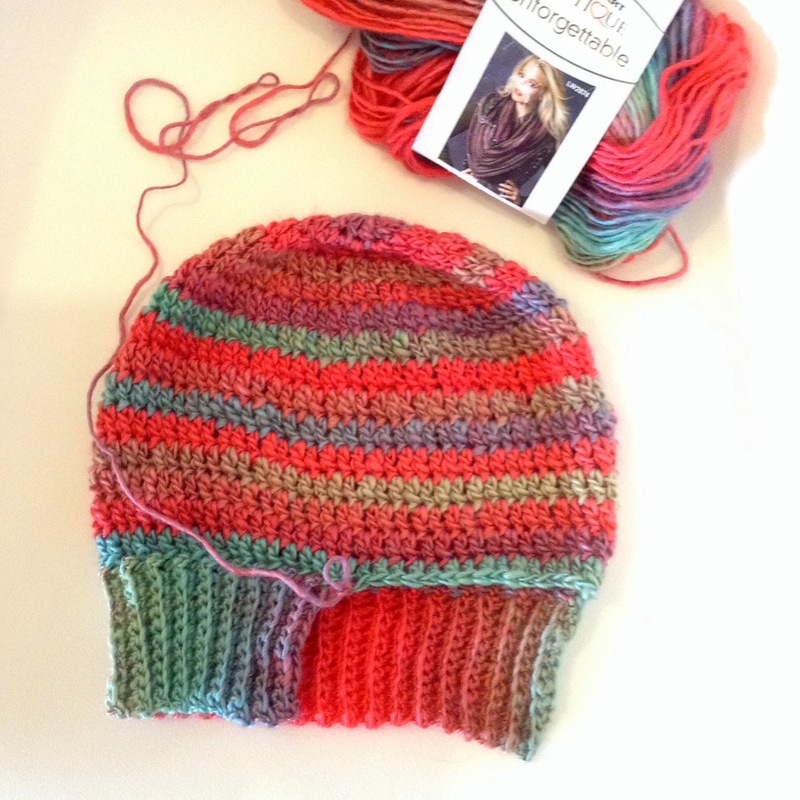 I am in the process of making this hat... getting ready to do the ribbing. I am so excited and love the way it is turning out! Thank you for this awesome pattern! How many yards of yarn does the pattern use? Love this pattern, worked out perfectly! I don't understand the last part of this pattern. I've crocheted the entire hat but the ending is hard to do. Any advice on how to do it? What u wrote makes no sense to me. Help! Just just made this hat with a Patons worsted wool. It came out very nice. I particularly like the ribbing method. Thanks for sharing! 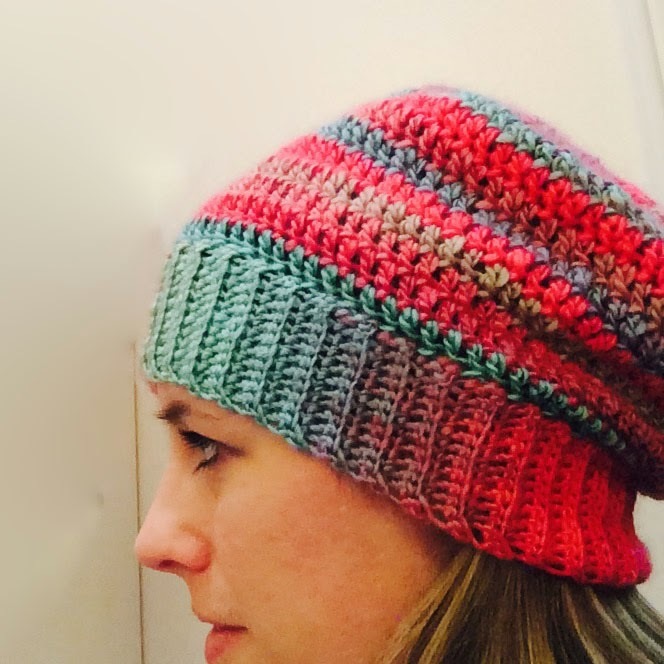 just found this pattern, and made the hat in about 3 hours - love it!!! i turned the ribbing over to create a kind of thirties style hat, and it looks really cute now... :-) thanx for the easy to follow pattern!!! Just finished this hat. Needed the instructions on attaching the ribbing properly. Thanks so much. I have been making hats for years that are entirely ribbing except for a short decrease at top of singles. So very familiar with ribbing but never could get it right when switching to it.